Pennington Classic Wild Bird Feed. Great entertainment for your yard. The bird feed people. Pennington bird seed has been specially formulated to attract different types of birds based on scientific experimentation. Today, the birds' choice of seed, their dietary requirements and the nutritional value of each ingredient are used to establish a balanced blend. Vitamins and minerals supplements, not readily available in nature, are added to the bird seed mixtures and blends creating an enriched seed diet that birds love. The Pennington Wild Bird brand chooses only the best... seriously tasty, highly nutritional, vitamin enriched Pennington wild bird seed. Turn your backyard into a natural habitat for birds by feeding them year-round. A plentiful supply of Pennington's vitamin enriched bird foods will attract newly hatched birds, as well as many other varieties of seasonal migrating birds. Fresh seeds, a clean feeder, and a constant supply of clean water are preferred by birds. 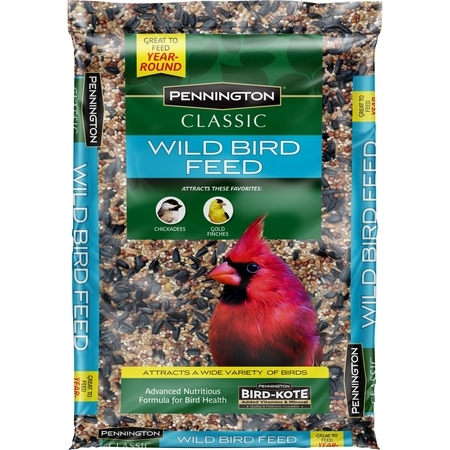 Pennington Classic Wild Bird Feed. Great entertainment for your yard. Attracts a wide variety of birds. Vitamin enriched variety mix that helps provide a balanced diet. Attract these favorites: Cardinals, Goldfinches plus Titmice, Doves, Downy Woodpeckers, Grosbeaks & Nuthatches. About Pennington bird seed: Pennington bird seed has been specially formulated to attract different types of birds based on scientific experimentation. Today, the birds' choice of seed, their dietary requirements and the nutritional value of each ingredient are used to establish a balanced blend. Vitamins and minerals supplements, not readily available in nature, are added to the bird seed mixtures and blends creating an enriched seed diet that birds love. The pennington wild bird band chooses only the best... seriously tasty, highly nutritional, vitamin enriched Pennington wild bird seed. They're determined to find only Pennington and are searching your neighborhood right now looking for their favorite seeds. With every feeder in your yard it's like landing another front row ticket to your favorite backyard show. Every seed sets the stage, bringing out a variety of those special feathered friends that the whole family loves to watch. From Chaz the Cardinal to Finch the Red Finch to Chick-a-Dee the Black Capped Chickadee to Lester the Woodpecker you too can have your own wild bird band in your yard, all year round. Just fill your feeders with Pennington wild bird feed and be ready, because an incredibly entertaining show is about to begin! Seed & ingredients attraction chart. What Birds can you attract with Pennington bird seed? Attraction chart: Sunflower: Blue Jay, Cardinal, Chickadee, Dark-Eyed Junco, Grosbeak, Goldfinch, Indigo Bunting, Mourning Dove, Northern Flicker, Siskin, Purple Finch, Nuthatch, Towhee, Sparrow, Titmouse, Woodpecker. Safflower: Cardinal, Chickadee, Grosbeak, Mourning Dove, Nuthatch, Sparrow. Millet: Cardinal, Chickadee, Grosbeak, Mourning Dove, Nuthatch, Sparrow. Thistle: Chickadee, Dark-Eyed Junco, Goldfinch, Indigo Bunting, Mourning Dove, Siskin, Purple Finch, Sparrow, Titmouse. Sunflower Chips: Blue Jay, Cardinal, Chickadee, Dark-Eyed Junco, Grosbeak, Goldfinch, Indigo Bunting, Mourning Dove, Northern Flicker, Siskin, Purple Finch, Nuthatch, Towhee, Sparrow, Titmouse, Woodpecker. Peanuts: Blue Jay, Cardinal, Chickadee, Dark-Eyed Junco, Grosbeak, Nuthatch, Towhee, Woodpecker. Turn your backyard into a natural habitat for birds by feeding them year-round. A plentiful supply of Pennington's vitamin enriched bird foods will attract newly hatched birds, as well as many other varieties of seasonal migrating birds. Fresh seeds, a clean feeder, and a constant supply of clean water are preferred by birds. Ingredients: Milo, White Proso Millet, Wheat, Sunflower Seed, Calcium Carbonate, VItamin A Supplement, Vitamin D-3 Supplement, Potassium Iodide, Vegetable Oil. Instructions: Storage instructions:Reseal package and store in a cool dry place. This will protect against insect infestation that can naturally occur with any whole grain seed product.Store in a cool, dry place.